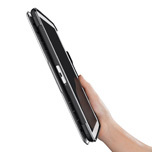 (Berlin, Germany) – 5 September, 2013 - People-inspired technology brand Belkin has today announced the introduction of the Ultimate Keyboard Case for Samsung Tab 3 10.1. The newest addition to Belkin’s extensive tablet keyboard line up uses revolutionary aircraft grade aluminium alloy and magnet construction, making it one of the slimmest and lightest keyboard folios for the Tab 3 10.1 on the market, with a keyboard that’s just less than 8mm thin. The Ultimate Keyboard Case combines a durable aluminium base with a precise keyboard, all in a compact package which conveniently folds flat to hide the keyboard when watching movies or reading. The Ultimate Keyboard Case uses Smart Sensing technology to automatically turn the keyboard on when you need it, and off when you don’t, saving battery life and giving you instant access to Tab 3’s onscreen keyboard. Featuring Belkin’s award-winning TruType keys, the Ultimate Keyboard Case provides a smooth, laptop-like experience to enhance typing speed, accuracy and comfort. All ports and buttons are exposed to allow full operation of your Galaxy Tab 3 10.1, including charging, and Android specific shortcut keys provide easy access to all major function keys that are available on your tablet. 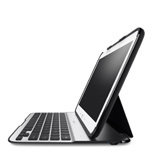 The Ultimate Keyboard Cases’ Neodymium magnets hold your tablet securely at the exact angle you want it, with no shifting or slipping, and the impressive 6 month* active battery life ensures your keyboard case will be ready for use wherever and whenever you need it.